I have been using focusing masks with my DSLR cameras and telescopes for many years and have found them to be a simple and cost effective focusing solution. For my new Meade 12" LX600, OPT recommended the Astrozap AstroCap. 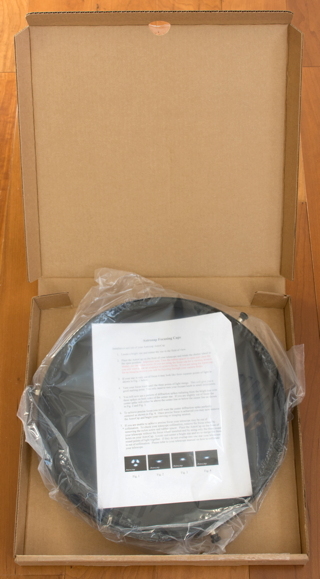 The AstroCap comes assembled and includes a single page instruction sheet, as seen at the right. There are three nylon bolts around the circumference ring to secure the cap/mask to the telescope. There is also a soft rubber tape already applied around the ring to protect your telescope tube and to provide additional security. A central bolt holding the rotating Mask piece was slightly loose (from shipment? ), which allowed the Mask to rotate too freely. A small turn of the bolt adequately tightened it down. The Mask is then rotated for open/close by turning the central rubber "spacer". 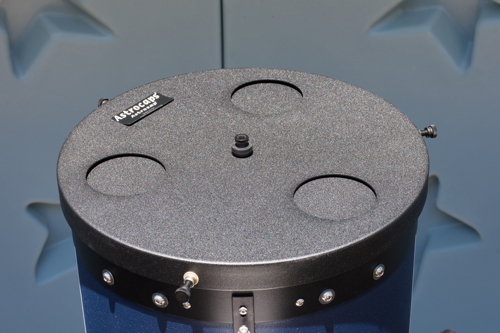 I discovered one minor problem when mounting the AstroCap on my 12" telescope. If the cap is placed all the way onto the telescope tube, the Mask portion could not be rotated since it was being held between the cap and the telescope tube. Sliding the AstroCap back out a little bit allowed the Mask to be free and it could then be rotated. As you can see, the Mask openings avoid the central obstruction of Schmidt-Cassegrain and ACF telescopes. When used visually with an eyepiece, the diffraction lines were very crisp, both out of focus and in focus, making focusing for visual purposes very accurate. With a bright star like Sirius the lines are easily seen. I also focused on a faint star, Magnitude +4.1, and I could still see the diffraction pattern although the lines were much fainter. It was still possible to achieve accurate focus with this faint star. 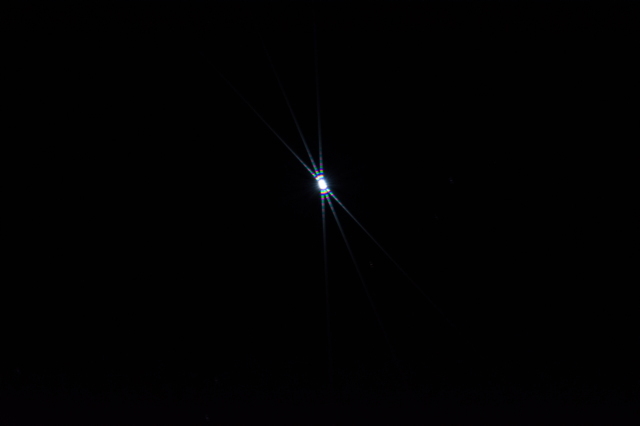 With a bright star like Sirius it was easy to see the lines in the D7200 DSLR viewfinder and on the Live View screen, which made it very easy to get an accurate focus for imaging. 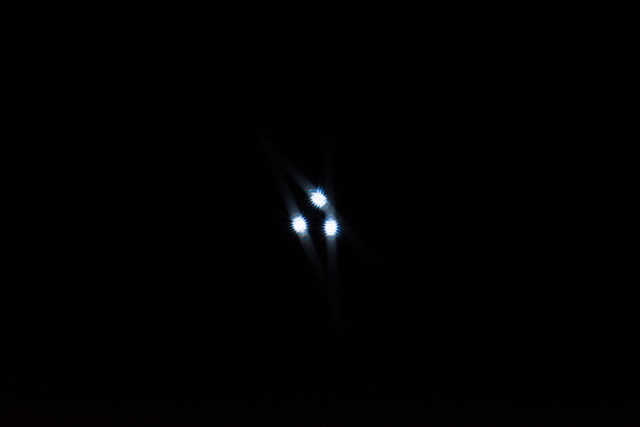 Having previously used a "full aperture" Bahtinov Mask I had initially wondered if the three smaller openings would affect focusing on fainter stars. 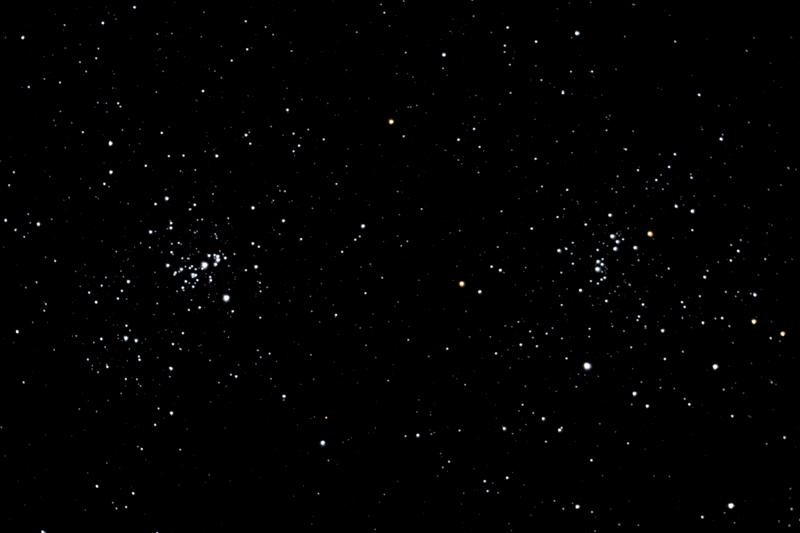 As it turned out, while the lines were fainter with a faint star, visual focusing was still possible (at least with the 12" aperture telescope). Normally, as with any mask, it should be used with a bright star (at least Magnitude +2). With the frequent wind and blowing dust and pollen here in southern Arizona I am not likely to use the AstroCap as a permanent aperture cover. The Mask openings would allow dust/pollen to get onto the telescope corrector lens even with the cap closed. However, if your location does not have this dust or pollen problem then you could use the AstroCap on the telescope when not in use. Astrozap has the AstroCap, as well as more traditional focusing screens, for almost any aperture telescope. Check their web site. 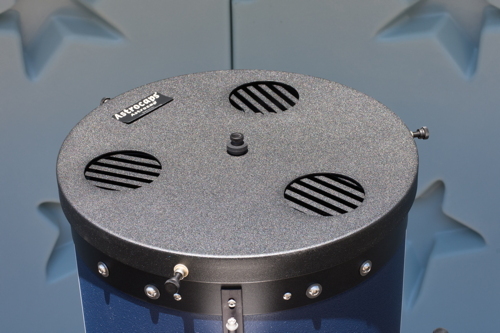 The AstroCap is another well made product from Astrozap. The cap is made from sturdy metal, with nylon bolts to provide security. I expect to get years of use from it.